Scuba Computers – Scuba Computers will not only keep your time underwater, but track your depth and your time at depth. While it’s important to understand how dive tables work, having your calculations done for you is pretty nice. The difference between these Scuba computers and those listed on our Scuba gauge pages is the gauge or integrated air function is missing on these computers. To learn more about scuba computers, visit our Scuba Dive Computer page. 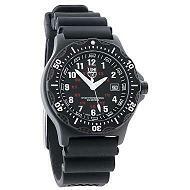 Water Resistance – usually comes associated with a depth rating. I usually recommend a water resistance of 200 meters or deeper. Many new divers think that since they will not dive deeper than 50 meters, they can save some money with the 50 meter diving watch. Remember that static pressure is different than dynamic pressure. Think of it this way; a diver does a giant stride off of a dive boat. The diver’s wrist slaps the top of the water on the way down, momentarily; the diver’s watch will be exposed to some pretty high dynamic pressure, even though the diver is not at a great depth. 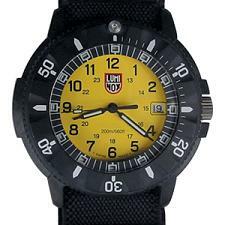 There is a rumor that all watches are rated for “water resistance” and not “water proof”. 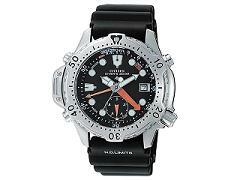 Check out our Extreme Dive Watches for real water proof watches. Rotating Bezel – is a dial that sits on your watch face. It usually has delineations marking intervals in minutes. If you would like to measure the time of your dive, just adjust the rotating bezel to align the zero mark with the minute hand on the watch. Now you can read the minutes elapsed as the minute hand moves around the bezel. All of the better watches are easy to read and have the rotating bezel designed to move only in a counter-clockwise direction. This counter-clockwise design will eliminate accidental movements that will lead the diver to think they have more time than they really have.